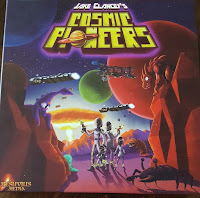 After chatting with the Vesuvius Media team at Gen Con 2016, Christopher and I selected Cosmic Pioneers as our first foray into this publisher’s game catalog. The artwork on the box is cute and cartoonish and it made me feel good about opening up the game to get a closer look at its components. 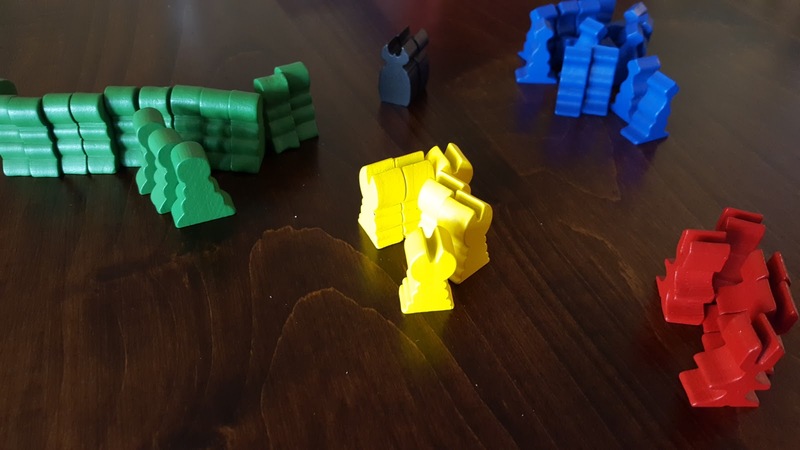 The game pieces are a mix of cardboard cutouts (player boards, round track, planets), cards (for scenarios and alien events), and sturdy wooden objects (cubes – for place markers and to represent colonists; and figures – to represent aliens). These components are visually appealing and they tie into the game’s theme very well. The plotlines and game objectives for Cosmic Pioneers are simple and entertaining: all players are in a race to colonize the selected planets of the Tau Ceti system, accumulating victory points (by settling and controlling planets as well as hoarding cash reserves) along the way. Hostile alien species as well as our fellow players seek to thwart our goal. At the end of 12 rounds, the player with the most victory points wins the game. 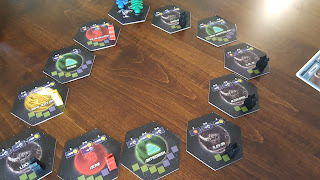 The game offers variability in the plot through an abundance of planets and aliens to select from in setting up each game as guided by the scenario cards, so there is a lot of replay ability built in. So far so good – quirky playful artwork, well themed components, and engaging plotline. That’s why I was so sad to find that as soon as we got into the mechanics of the game, things started to fall apart. When landing at the Jumpgate (think of this as a home base of sorts), a player may dispose of unwanted cargo from their ship’s cargo hold (be it aliens, opponent’s colonists, player’s colonists, or goods). Does the disposed cargo go onto the Jumpgate tile or back into reserves? When landing at the Jumpgate, players may also load as many colonists onto their ship as they can fit into their available cargo slots. Are these colonists limited to the subset of what was dumped off on the Jumpgate before? Or do we pull from reserves so that even if none of our colonists were ever dropped off at the Jumpgate before we can still fill our cargo hold? At the beginning of the game all players begin on the Jumpgate. Does this mean each player begins the game with colonists in their cargo? 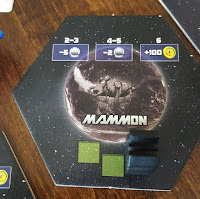 The rules say when in the Adventure phase of the game, upon landing on a planet, if a player rolls a dice combo that allows for it they may place colonists from their reserves on the planet. This would imply they don’t need to come from the player’s ship cargo hold. In fact another separate phase of each round is the Deployment Phase within which players may unload/load ship cargo (which includes life forms) so it seems likely that taking colonists from the reserve pool (vs the cargo hold) is for initial planet settlement while taking colonists from the cargo hold is for moving colonists from one planet to another. But if this were true and planet settlement through the Adventure phase comes from the reserves, then why did they build in the step to load colonists onto our ships whenever we land on the Jumpgate? The rulebook has no mention of players beginning the game with any cash yet the example picture on page four of the book shows each player starting with 300 in cash. It cannot be a result of the scenario card selected because the scenario card featured in the picture clearly says players begin this particular scenario with 500 in cash. So do players start the game with cash and if so how much? 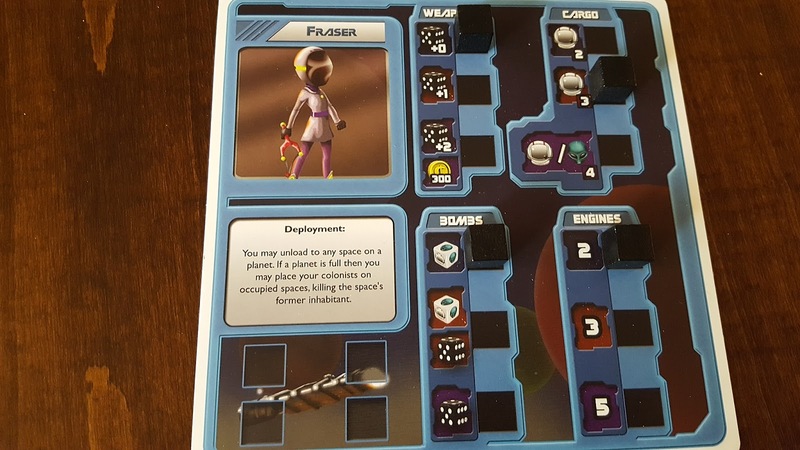 Notice that for a dice roll of 2 or 3, the player is supposed to remove five of their colonists from the planet. Five! On a planet that can only hold 3 lifeforms total (one slot is currently taken by an alien). Already frustrated with these unanswered questions and die roll result nonsensical instructions, Christopher did a 1-800-NOPE out of this game halfway through when he found my character card to be too unfairly tilted in my favor. 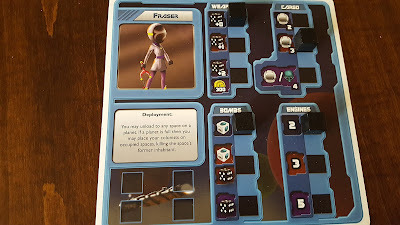 I had selected Captain Fraser, whose special ability is that she can kill off other player’s colonists and aliens taking up slots on a planet if the planet is full. Normally a player can only place their colonists on empty spots on a planet and so for a fully settled planet they’d need to attempt to bomb lifeforms off the planet first which involves dice rolling and luck). He grew pretty irritated watching me visit every planet he had fully colonized and removing his colonists and replacing them with my own. 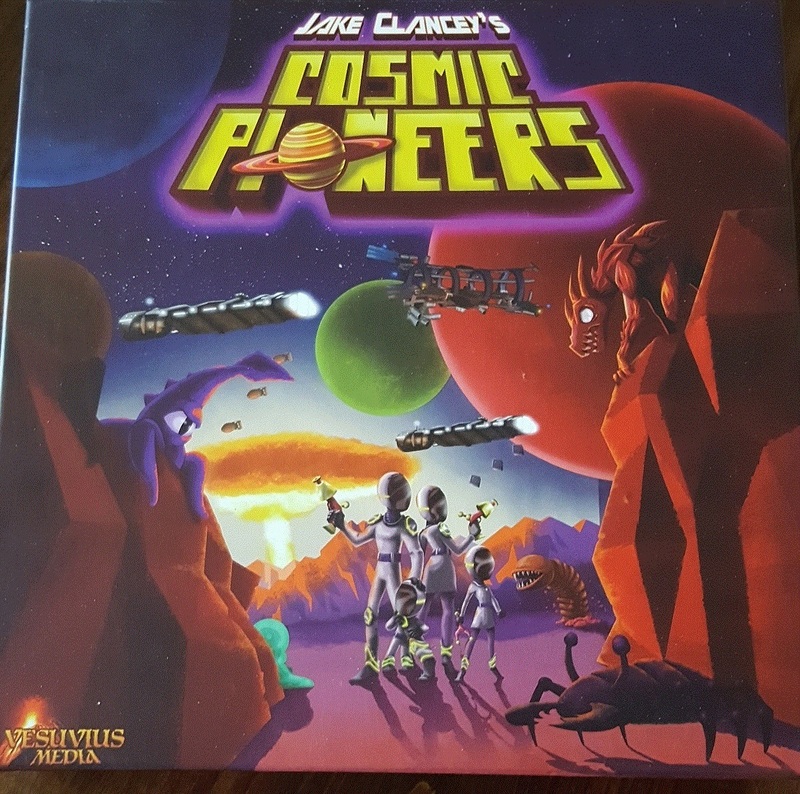 I’m disappointed that Cosmic Pioneers is rather unplayable in its current configuration. The good news is that the game has some great foundations (nice artwork, good plot) and could probably be rendered playable pretty easily with some thoughtful editing of the game mechanics and rulebook by the designer. If that should happen in a future edition, I’d definitely be willing to take another shot at playing the game. 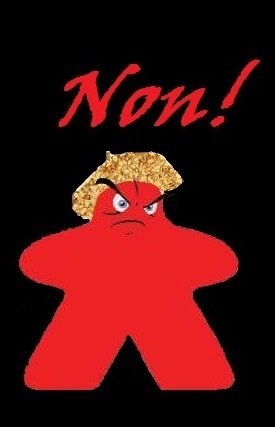 OUI: I would play this game again; this game is ok. I probably would not buy this game myself but I would play it with those who own it and if someone gave it to me I would keep it. OUI OUI: I would play this game again; this game is good. I would buy this game. OUI OUI OUI: I LOVE THIS GAME. I MUST HAVE THIS GAME. NON: I would not play this game again. I would return this game or give it away if it was given to me.